Through the power of art, a variety of colors can mirror love and romance when the romantic feeling of an artist is expressed on a canvas with emotions and passion. Romance is best known as a feeling of excitement associated with love. In fact, almost everyone experiences the feeling at some point in their lives. While love and romance have become fundamental parts of life, art explore the insight of human feelings and experiences. In the realm of art, nevertheless, love and romance have different interpretations depending on how the artist sees it. Art is a reflection of feelings and impressions, which often stem from the insight and imagination of an artist. In many cases, an artist expresses his or her state of mind in portraying either the artist’s own experiences or the real world, in which one particular relationship becomes the most essential thing in life. In this edition, we take you to glance at three romantic masterpieces where the artists explored their pensiveness about their respective meaning of love and romance on canvas. The Austrian symbolist painter (1862 – 1918) was trained at the school of Applied Art in Vienna in the late 1800’s, during which his country imposed censorship. Klimt eventually opposed the government by forming secession group with his fellows. Klimt believed that art should flow freely and he was once fed up with the censorship. His exploration on human relationships led to the creation of a number of romantic masterpieces. 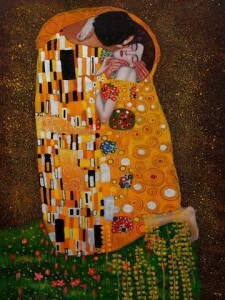 The most famous one is “The Kiss”, the oil painting he created in 1907 – 1908. Painted on the 20×24-inch canvas, “The Kiss” portrays a man kissing his woman as a means of sharing a joyous life. The joy is also symbolized with the couple dissolved in an embrace, as they stand against a beautiful decoration that is flecked with gold leaf. The gold is somehow similar to the mosaics found in Byzantine churches, but Klimt was heavily influenced by Italian mosaics, as he put a touch of Italian mosaic technique in painting the gold leaf. 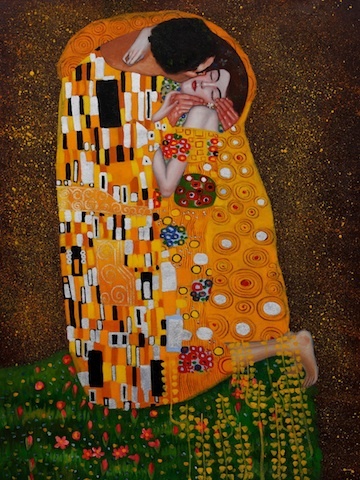 Some say that the woman in the painting is Klimt’s companion, Emilie Floge; while there are unreliable sources saying that the two subjects in the painting are actually Klimt himself and Emilie. Nevertheless, many believe that neither is true. It’s just merely speculation news, as Klimt never painted himself. The original painting of “The Kiss” is currently displayed at Österreichische Galerie in the Belvedere Palace in Vienna, Austria. One of the most recognized artists in the twentieth century art, Pablo Picasso (1881 – 1973) is known for his uncanny artworks. His masterpiece, “The Lovers”, which he oil painted in 1923 is quite unique, indeed. With his typical style of cubism, the Spanish painter depicted the classical tradition of French romantic drama. There is the theatrical element in the painting with different interpretations, depending on the eyes of the beholder. One interpretation can be seen from the pale colors of the two lovers, as they have been frozen with the woman holding the man’s hand. The expression of the man while gazing at her shows his true love. Another interpretation can be a depiction of a couple with their eternal love regardless of the conditions they are facing. 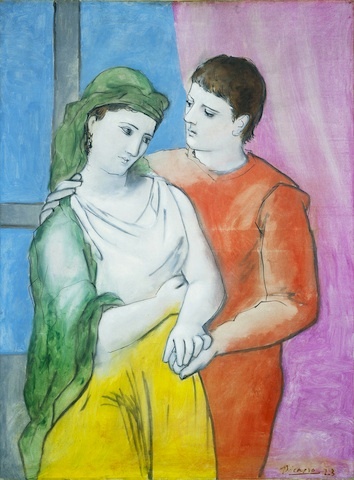 In general, Picasso painted a picture of a restrained emotion of stiffness and sorrow in his “The Lovers”. The original painting of “The Lovers” is measured at 51 ¼ x 38 ¼ inches and is currently housed at the National Gallery of Art in Washington D.C.
One of the renowned French painters of impression style, Pierre-Auguste Renoir (1841 – 1919) depicted a typical romance of city life through his painting, “Dance in the City”. Oil painted on canvas in 1883, the 28×54-inch “Dance in the City” tells a deeper meaning than just showing a couple dancing. Rather, Renoir expressed his emotion in picturing a couple in the roses and candy stage of a relationship. It’s a mixed of uneasiness and sweet expectancy in the pursuit of the meaning of love. The lady in the painting is Suzanne Valadon, who was an artist and model for Renoir’s number of paintings. There are several meanings people can interpret the painting. One example is the melodies of colors. The woman’s being elegant and stylish in appearance depicts her good manner. However, when you turn your eyes on the face, you can read another story. Renoir`s “Dance in the City” is currently displayed at the Musée d’Orsay in Paris. Text: The Writerpreneur. Published in The Nirwana (an in-house magazine of Nirwana Bali Resort).